The reasons for getting a crown range from protecting a weakened or broken tooth to simply having a better-looking set of teeth. Crowns cover the whole tooth. They act like your old tooth and become one with your mouth. This also means that when you have a crowned front tooth, that crown becomes one with your smile. Making the right choices when it comes to choosing a crown can help lead to a better and beautiful smile. ook like a comic book villain. The other metallic options put you in the same boat. 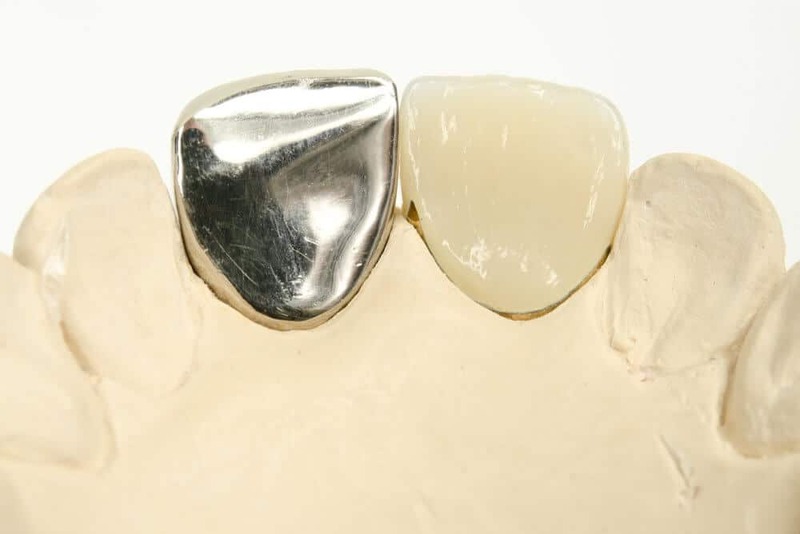 Porcelain and ceramic crowns, while more expensive, can be made to match the shade of your other teeth, and when you have a crowned front tooth you want to make sure the crown looks like it belongs with your other pearly whites! Crowns are not the only option when dealing with the look of your front teeth. Veneers can cover the front of an affected tooth or teeth to help you have a great looking smile. According to an article on DentalEconomics.com, there are a series of criteria your dentist will examine to see whether veneers are a better option for covering your front tooth. There are several situations where having a crowned front tooth is healthier for your mouth in the long run. Listen to your dentist’s advice. The American Dental Association writes that whitening treatments are less effective on crowns than they are on your natural teeth. Consequently, if you are thinking about pursuing a whitening treatment, have the procedure done before you go for a crowned front tooth. After whitening, you and your dentist choose the crown you both feel best matches the rest of your front teeth. The shade and reflectivity of a crowned front tooth change with each kind of material. Find the material that suits the rest of your teeth best. Stay away from foods and drinks that discolor your teeth. Drinking coffee or tea can alter the color of the enamel surrounding your crowned front tooth. This can make it stand out from your natural teeth. You must also be careful about what you eat, as some foods can damage a crown. According to Livestrong, avoid sticky and hard foods when you have a crown, especially with your temporary crown. A crowned front tooth is vulnerable to getting damaged when you bite into something hard. Quit habits like biting on pencils, nails, or ice should you get a crowned front tooth. With permanent crowns, you may also want to avoid hot and cold foods like soup and ice cream. These temperatures won’t necessarily damage your crown, but they could cause you some discomfort. Maintaining the health of your crown isn’t all that different from taking care of your natural teeth. You want to brush and floss on a daily basis. Regular trips to the dentist will also ensure your crown is in tip-top shape. At home, be careful when flossing if you have a temporary crown. Gently pulling the floss out from between the teeth instead of pulling up ensures you won’t pull the crown out along with the bits leftover from lunch. Another tip is to try using toothpaste for sensitive teeth if you experience any sensitivity to heat or cold. If you take good and regular care of your teeth, your crown will benefit as well. WebMD enumerates the various things that can go wrong with a crown. Over time they can become chipped, loose, or fall out. A chipped crown on your molar probably won’t be noticed. If you have a crowned front tooth, these issues need to be taken care of right away. Some people have an allergic reaction to their new crown, and this is something you should also be on the look out for when you get your new crown. Allergic reactions are very rare, but keep on the lookout for any symptoms you might experience with your new crown. Do you have a chipped or broken front tooth? Are dissatisfied with the appearance of your front teeth? You might need a crown. Choosing to have a crowned front tooth is a decision McCauley Dental will help you make with confidence. Contact us for a free consultation today.